Many carrots go beyond being long and orange. In fact, originally, carrots weren't long and orange at all. White, red, yellow, and even purple carrots have been showing up more and more in farmers markets and grocery stores. Speaking of grocery stores, those baby carrots aren't actually baby carrots; rather, they have been cut and shaped from larger ones! But our 'Little Finger' is an actual, Imperator-type baby carrot, reaching 3" at maturity. Carrots aren't all the same size and shape, either. 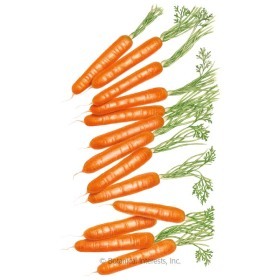 Chantenay carrots are 5"-6", short, fat, and tapered and can be sown later than other types. Danvers carrots are 6"-8" and thinner than chantenay. Nantes are 6"-7" and cylindrical with no tapered end. 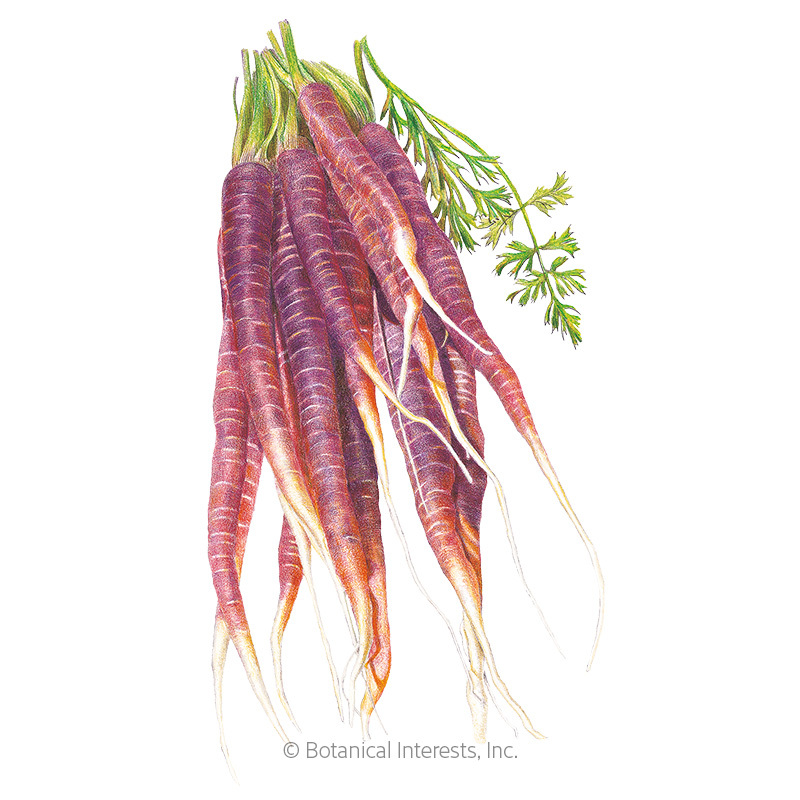 Imperator carrots have the longest roots with tapered ends; up to 10", and is usually what you find in grocery stores. 'Tonda di Parigi' is a small, naturally round carrot in a class of its own; it does not fall into any of the four primary carrot types. Interestingly, carrots are a part of the Apiaceae (formerly Umbelliferae) plant family, which also includes angelica, caraway, cilantro, dill, fennel, chervil, and lovage. Members of Apiaceae typically have umbel-shaped flowerhead, meaning clusters of flowers in a shape similar to an umbrella like a dill flower. How many feet should I plant? You can grow 4 carrots per foot and you can usually grow several rows 6" apart, parallel to each other, so a lot of carrots can grow in a small amount of space. Carrots store well in the crisper for several weeks. Root crops like carrots grow best in loose, rock-free, rich, well-drained soil where the tap root can easily navigate deep into the soil. If your soil is compact, fluff it with a garden fork or consider using a rototiller before sowing seeds. Unless you are growing short carrots, 18" or more depth of loose soil is recommended. Add compost or other amendment to the soil at the same time as you loosen it or scratch or rake it in prior to sowing. Keep carrots well weeded, especially when small. If possible, fertilize prior to sowing. Potassium and phosphorus are important for root growth, and unless soils are nitrogen-deficient, fertilize with a weight toward these two nutrients. When adding organic material, be sure it is well-seasoned, as fresh manure is often too high in nitrogen and can cause carrots to "fork." Regular watering is essential. 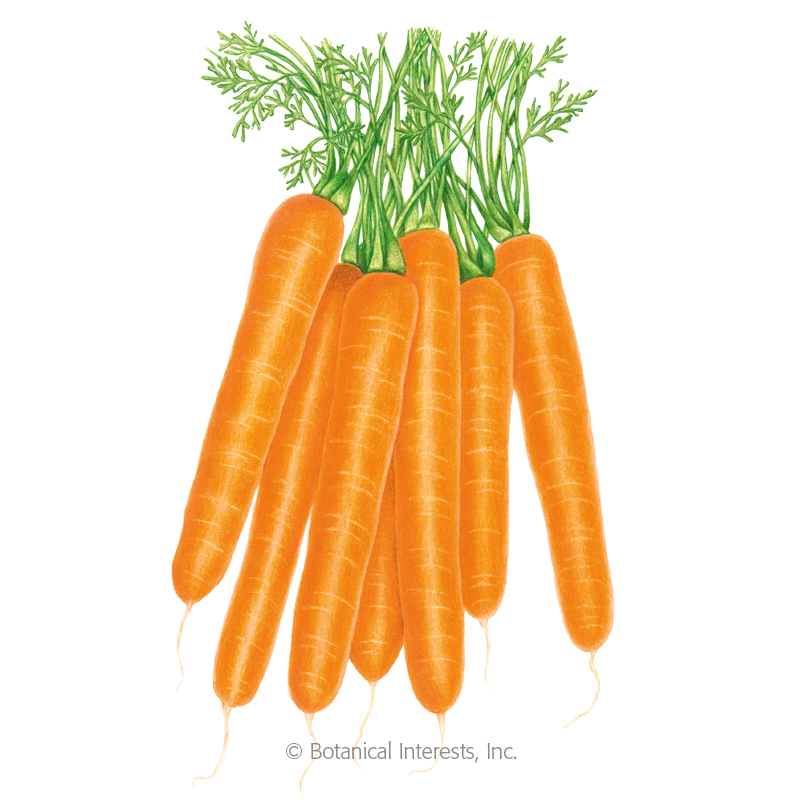 Don't let carrots dry out; consistent moisture promotes fast growth and sweet roots. 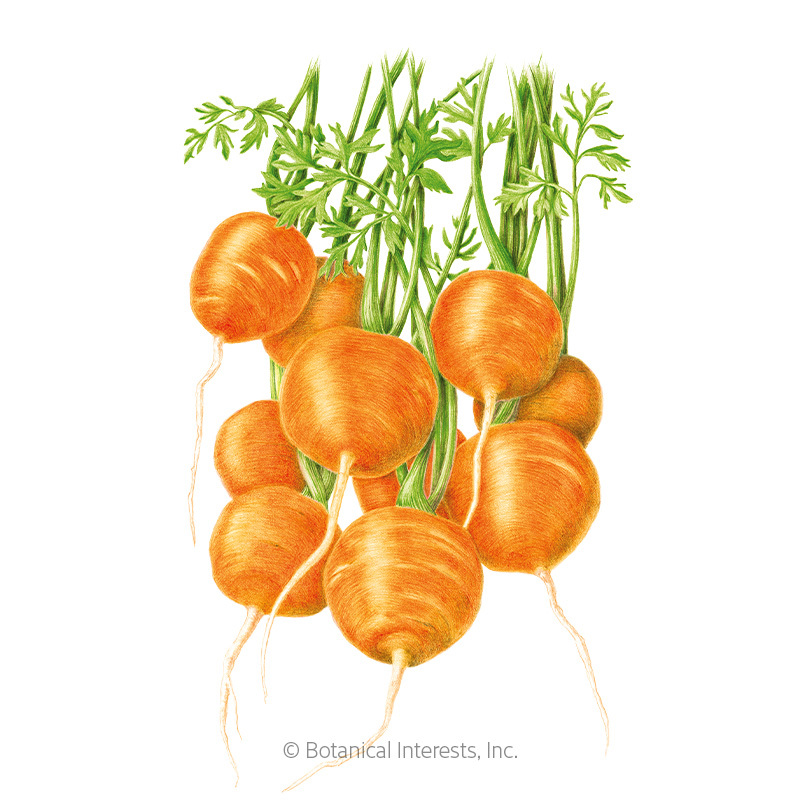 It's common for carrot seed to take 3 weeks to germinate, especially in cool, spring soil. Be patient with carrots and continue to keep seeds moist. When 1" tall, thin to 2" or 3" apart, depending on variety. Don't pull the seedling out, as this might disturb and damage the root of the neighboring seedling; instead, cut off the seedling at ground level with scissors. Once seedlings have emerged, a layer of mulch can stifle weeds and keep roots consistently moist. If carrot crown is exposed, cover with mulch or soil to prevent "greening" from sun exposure, which results in bitter flavor. The same location should not be sown with members of the carrot family any more than once in 3 years. For best flavor and texture, harvest carrots any time before, and until they reach their optimal size. Harvest with a flat-tined garden fork placing the fork at least 6" from the roots to prevent damage, pushing the fork as deep as possible into the soil and then lifting the carrots. It is easiest to harvest carrots when the soil is moderately moist, rather than dry or wet. Holding the top of the lifted root, give it a gentle twist to set it free from the any remaining soil. Peak harvest period lasts about 3 weeks, longer in the fall. Late-summer-sown carrots are sweetened after having been kissed by light frost; however, harvest before soil freezes, which may destroy the crop. In USDA zone 5 or warmer, carrots can be left in the ground for storage provided they are heavily mulched; harvest as needed on days the ground is not frozen.